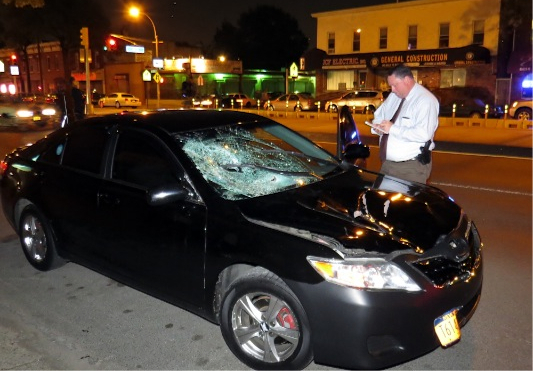 A motorist who allegedly killed a senior while driving without a license, who police said was speeding, and who was reportedly wanted by authorities on another vehicular charge at the time of the crash, has been charged with a misdemeanor by Queens District Attorney Richard Brown. Online court records say Rodriguez, 25, was charged with driving without a license and aggravated unlicensed operation of a motor vehicle in the third degree, a misdemeanor that stipulates that he drove without a license when he knew or should have known he didn’t have one. The Post reported that, according to Brown’s office, Rodriguez was wanted on a warrant issued in April for unauthorized use of a motor vehicle — taking or operating a vehicle without the owner’s consent. Despite the allegation that he was driving without a license, the police account that he was speeding, and the outstanding warrant, Rodriguez was not charged for killing Rafael Diaz. This is not unusual. In 2011, two unlicensed drivers each pled to a top charge of third degree aggravated unlicensed operation for the deaths of Yolanda Casal and Laurence Renard, pedestrians killed in separate crashes in Manhattan. In each case, the driver was fined $500. Rodriguez is next scheduled to appear in court on October 10. This is a clear Rule of 2 candidate. The law requires vehicular manslaughter charges here, am I correct? Queens, please replace your DA or else this will keep happening. If he were to shoot someone by accident with an unlicensed gun, I’m sure we would see similar penalties. You forgot operating the unlicensed gun in an illegal way (e.g. speeding). Screw the stupid “Rule of Two,” anyway. If you’re driving 60 MPH on a city street, and you strike and kill someone, you’re a murderer. No “two” ways about it. In my book, Queens District Attorney Richard Brown is an unindicted co-conspirator in the killing of Rafael Diaz. It shouldn’t even need to be 60 MPH. If you strike and kill someone while driving faster than conditions allow (which would be the case if you strike and kill someone, as driving at or below what conditions allow would allow for you to stop/slow down/avoid the collision), you are a murder. I don’t care if you’re doing 33 in a 35 zone. The posted limit is a maximum. It’s not some sort of get out of jail free card. If it’s pea-soup foggy and you can’t see 20ft down the road, but still drive 33 and kill someone, that’s murder. If you can’t see far enough down the road for any other reason to avoid a collision and kill someone, that’s murder. If you are rounding a blind curve and kill a cyclist because you ‘came up on them too fast to react’, that’s murder. It doesn’t matter if your speed is below, at, or above whatever is posted on the sign. Ultimately the person pushing down the pedal is responsible for murder. By simply turning the key and moving the vehicle, you are engaging in an activity that is known by all to be highly lethal. Failure to exercise due care is itself an intentional act, and an intentional act that knowingly results in death. Knowingly and willfully engaging in an action known to commonly result in death, which then results in a death, is indeed MURDER. Not manslaughter, but murder. Sorry, but I think you are indeed confusing manslaughter and murder. Murder is typically knowingly and willfully engaging in an action known to commonly result in death with the intention of causing death. Manslaughter is knowingly and willfully engaging in an action known to commonly result in the death with an intention other than causing death. Manslaughter is still serious business, and in many cases deserves the same legal and social penalties as murder. But at the end of the day the language provides for two different words to describe the killing of one human being by another based on intent, and we should use them accordingly. Is it possible to operate an illegal unlicensed gun in a legal way? Only if said gun somehow incorporates four wheels and a motor. This was my girlfriends ex father in-law that was killed by this driver , and he should be charged with manslaughter at the very least !! It is unbelievable how you can kill someone in this country and get away with it if you are driving a car. Hey, Queens DA guy, I’m wondering what others laws you are cool with people breaking? And do I have to be breaking more than one to get away with it? Also, I don’t really want to kill anyone, is that a requirement-someone’s death? Oh, also, do any of these crimes you are going to let me get away with, do they have to involve a car? I can see clearly the lives of pedestrians and cyclists are not worth very much in NYC prosecutor’s eyes, so I’d understand. The fact that the circumstances that lead to ‘manslaughter’, as you would call it, aren’t already a felony is wrong. Speeding should be a felony charge. Running red lights should be a felony charge. Both are 100% preventable and shouldn’t happen, ever, and when they do, they dramatically increase the chances of killing someone else. Things like that should result in jail time in some cases, or a few thousand dollar fine and few thousand hours of community service in others. Crimes that are likely to result in the death of another are felonies, not misdemeanors. Misdemeanors are things like tagging a wall or spitting gum out on the sidewalk. Driving 52 in a 30 isn’t a misdemeanor, it should be a felony, and if that felony results in killing someone, that’s murder. The fact that speeding isn’t even a damn misdemeanor is absolutely mind-boggling stupid. Saying speeding should be a felony is stupid. Do you realize the consequences of being a convicted felon? Grouping someone who does 5 or 10 mph over the speed limit in with murders is nonsensical and impractical. If you are trying to claim that you have NEVER sped, you are likely a liar. And in response to your “as you call it” comment on manslaughter, you are simply displaying your lack of legal knowledge. Every killing is not always intentional. These are things lawyers must prove. It’s the law, not that person’s opinion. Lots of things can result in death, that does not make them automatically felonies. Nor should it. Stop reading Wikipedia to learn about the law. Read a book. Perhaps a compromise is to make speeding or running a red light a felony if it results in serious injury or death. That said, I’m personally lukewarm to the idea of putting drivers who kill or injure in jail for long periods, unless of course it’s obviously intentional, as in they chase after someone solely to hit them. Rather, I feel if you kill or seriously injure someone through negligence, incompetence, or recklessness, you should lose your license permanently. That’s generally all the incentive we would need to get drivers to pay more attention to vulnerable users. Saying speeding should be a felony is stupid. Do you realize the consequences of being a convicted felon? Yes. And that’s why speeding should be a felony. I am very practical. There is this wonderful document called the Constitution that governs what can and cannot be done. The Eighth Amendment bars disproportionate punishment such as making someone a convicted felon for something probably 75% of driving people do arguably daily without incident. You cannot convict someone on the possible outcomes of their actions. The Supreme Court would likely laugh as they handed down their opinion that such punishment is absolutely unconsitutional. Everyone’s life is extremely valuable. I have lost someone to a traffic incident. But I have common sense and respect for the document that governs this country. I like my rights enough to not trample on others. Also, the “maybe if” argument does not work for me. DUIs are misdemeanors and felonies when they result in death. People continue to drink and drive at an alarming rate. So if someone shoots someone with a gun unintentionally, they should only have to have their licence to own a gun revoked permanently? I don’t think someone should be off the hook for large amounts of jail time for maiming or killing someone else simply because the weapon used happen to be a motor vehicle. The exact same penalty should apply for killing or maiming with a car as with a gun or a bat or a screwdriver or anything else. A gun is just as much a tool as a car is, if not more. I can easily feed myself and my family with a gun. A car doesn’t help feed at all, thus as far as ‘tool that aids survival’, a gun is much more a tool than a car. A car provides nothing but slow/lazy transport, while a gun at least is useful for killing game. Giving killing with a car a free pass because “cars are necessary” is stupid. I agree with you in principal. In practice as we’ve both seen it’s nearly impossible to give motorists more than a traffic ticket if they kill someone. That being the case, I would at least like an automatic penalty which basically revokes driving privileges for life if you kill or seriously injure someone (unless you can prove it was 100% the fault of the person you hit). At least such a penalty ensures the person won’t do it again, provided we also make it policy to seize and auction off vehicles driven by unlicensed drivers. By making the penalty automatic, motorists won’t be able to cop pleas. If someone dies or gets seriously injured, that’s it, you’ll never drive again. I would love for motorists killing or injuring to also get serious jail time. In fact, I would love motorists who kill people through recklessness to get executed. Unfortunately, this is a hard sell with a general public who views driving practically as a birthright. I think if we enacted my policy, within a decade there would be a large contingent of the population who lost their licenses for good. “Drivers” would be an ever decreasing voting block, and it might be easier to finally get stiff jail time for those who kill or maim behind the wheel. On another note, I would much rather have more lenient gun laws than more lenient driving laws. Provided you keep guns out of the hands of convicted felons or mentally ill, they generally result in far fewer “accidental” deaths than automobiles. True, but the issue how to keep people from driving without a license, once it’s revoked. I’d wager than probably close to 100% of those with lifetime revocations would just drive anyway. They’d never own a car worth more than a few hundred dollars again, so even if you seize the car, so what, it’s pretty much disposable. Short of putting a huge jail sentence on driving without a license, taking away licenses won’t have any effect, other than making a chunk of drivers permanent scofflaws. And if we’re going to try to put a huge jail penalty on a category of traffic violation, I think saying “kill someone, go to jail for a long time” is an easier sell than “drive without a license, go to jail for a long time” would be. Not to mention long jail time for killing someone is far more reasonable and less likely to be construed as ‘cruel and unusual’ than 10 or 20 years in jail for just driving without a license. You could get around the “driving without a license” problem by having RFIDs in licenses and some sort of ignition interlock. This is fairly easy to retrofit to all cars, and you would fail any car at inspection that didn’t have the ignition interlock installed, and hold it until the interlock was installed. Also, I’m not sure that there’s that big of a supply of cars worth only a few hundred dollars. My guess is the first round of drivers who lost their licenses would quickly exhaust this supply of cheap vehicles. You could prevent the seized vehicles from going back into circulation again by scrapping them. The state might make just as much money selling an old car for scrap as it would auctioning it off. By reducing the supply of vehicles, you increase the price of the remaining vehicles, making it less likely an unlicensed driver can afford to replace their vehicle over and over. In think we can both agree than any solution, despite potential drawbacks, is better than what we have now, which is basically allowing drivers to get away nearly scott free after killing or injuring people.